The winners of Colombia´s annual pro bono awards visited the Vance Center to exchange views on pro bono practice. Juan Peredo from Lloreda Camacho is “Pro Bono Lawyer of the Year” and Santiago Adarve from Cavelier Abogados is “Pro Bono Coordinator of the Year”. Fundacion Pro Bono Colombia, a key partner of the Vance Center in the Pro Bono Network of the Americas awards annually a trip to New York to experience the pro bono ecosystem. The Vance Center manages the visit, by connecting prize winners with Vance Center Committee law firms and nonprofit organizations in New York. The winners this year met Vance Center Committee members and other lawyers at Arent Fox LLP, Covington & Burling LLP, Proskauer Rose LLP, and Shearman & Sterling LLP, where discussion of the migration crisis in Latin America took center stage. Peredo and Adarve also discussed pro bono practices and structures with the Vance Center´s New York clearinghouse partners, including: Lawyers Alliance for New York, Safe Passage Project, and Volunteer Lawyers for the Arts. Colombia has a highly developed pro bono environment, including law school instruction, active engagement with civil society, and well-institutionalized practice within and among many law firms. The Fundación has two branches and includes in-house lawyers. 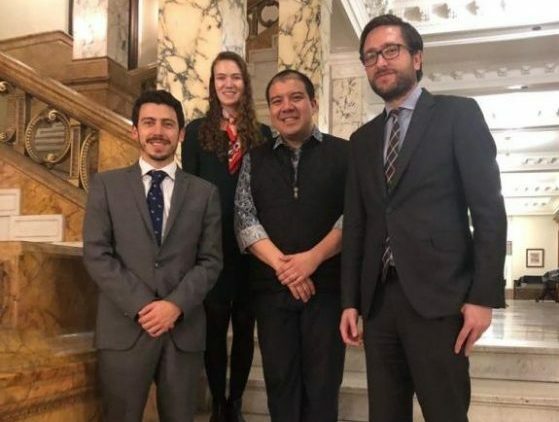 It has played an active role in supporting civil society’s participation in Colombia’s ongoing transitional justice process based on the 2016 peace agreement. The Vance Center thanks Mary Burner, Hunter Carter, Gina Del Chiaro, Kathryn Chmielewski, Saralyn Cohen, Sean Delany , Desiree Hernandez, Julissa Saragoza-Arroyo, Amy Lehman, Erin Meyer , Alexandra Rizio, William Silverman, and Katie Wagner for their generous participation.